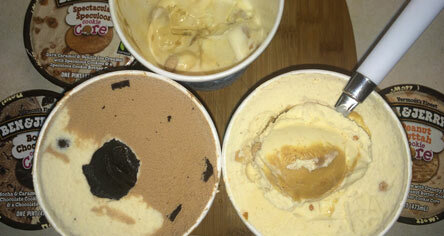 On Second Scoop: Ice Cream Reviews: Ben & Jerry's adds Cookie Core Lineup! Ben & Jerry's adds Cookie Core Lineup! Now you might remember that Nick and I weren't exactly impressed with last year's lineup of Core flavors (despite what all the click-bait websites might have told you), but this, this is how Ben & Jerry's should be. I've been talking up cookie butter for years now and it's awesome to see them here. Plus: Dark Caramel? Peanut Butter sugar bits? Speculoos? These can't get to my local stores quick enough. In the comments, let us know which one you want to try first. Big thanks to Charles for the heads up! ooooh, they all sound great. But I'm going to be most excited to try the peanut butter. Thanks for sharing this info! PB and Speculoos, especially the latter bc I can't get Speculoos in my area and I'm always dying to know what it tastes like when Dubba talks about it! Now these CORES look good!! Last years flavors were not that exciting to me because they were mostly a mashup of existing flavors. Can't wait to try them all!! Wait till you see what else is in the pipeline fellas! Thanks for the shoutout!!! What flavors will disappear to make room fir these? They all sound awesome, but B&J has a great coffee flavor so the first one with mocha sounds particularly good. The biggest problem for me is finding the cores in my area! Wal-mart runs out sooo fast. I will look forward to the non core new flavors. Hope they're good ones! The core pints just have too much going on for me. I really wish they would bring back the Oatmeal Chunk cookie flavor. Boom Chocolatta! all the way! Where has this been all my life??! They had me at cookie. What "are crunchy, sugar peanut butter bits"?! I hope it's the type of peanut butter crunch found in a Fifth Avenue candy bar! ah ha! 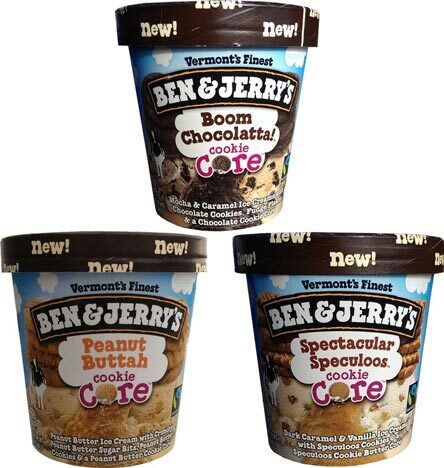 I read on the B&J IAmA the new core flavors were coming out next week, this is exciting. I am seriously interested in all three. I can't wait to read your reviews! I live in the Chicago suburbs (one the biggest cities in the nation) and can' find these flavors ANYWHERE!!! Can anyone help me find them?? Anyone live in Chicago and know which store carries them?